Egypt sits proudly on its 5000-year history, straddling the ancient and the modern with élan. Eight years after the Arab Spring froze its tourism sector, Egypt is back in business. In happy anticipation of foreign footfall, a 4,400-year-old royal priest shot up in the Saqqara necropolis near Cairo mid-December. As recently as last week, a maze of tombs was discovered in Upper Egypt with 40 mummies in them! That is Egypt for you – a live archaeological site where the venerable dead enthuse the living, where its magnificent temples of antiquity deride modern architecture, and where its 5000-year multi-cultural, multi-religious legacy resists attempts at homogenising an Arab Republic. Egypt’s history is beautifully preserved not only by the modern man, but also by those who had lived and died during those times. Ancient Egyptians sought eternal life, and meticulously prepared for it. 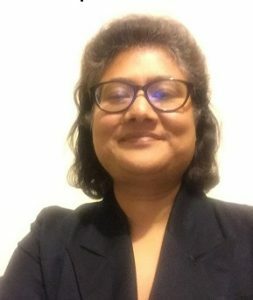 The pyramids, the mummies, the burial customs, the vibrant tomb art are all redolent of splendid success – in medicine, architecture and engineering. The most significant of their architecture is the boat that carried the ancient Egyptian to afterlife after mummification. 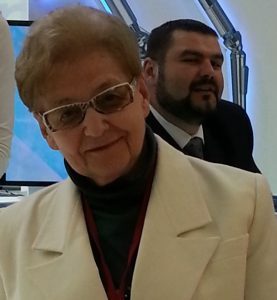 My husband and I, and our mini-Egyptologist daughter Hia, spent two glorious weeks in Egypt over the New Year of 2018-19. 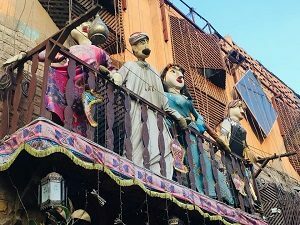 Our first stop was Cairo — all about shimmering towers, chaotic traffic, bustling hookah bars, glitzy malls and the magnificent liners bobbing on the north-flowing longest river in the world, the Nile. 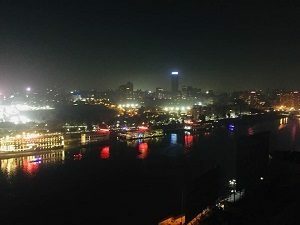 The Nile is Egypt’s ‘key of life’ – as centuries of civilisations have flocked and lived around it, abandoning the other 95 per cent of the country which is the Sahara desert. Thirteen kilometres southwest of Cairo is Giza, the country’s face to the world. It has three main pyramids – the great pyramid built by Pharaoh Khufu in 2550 BCE, a slightly shorter one by his son Khafre (2520 BCE) and the third by his grandson Menkaure. The Great Pyramid rises to a height of 481 feet built with nearly 2.5 million stone blocks. The mysterious Sphinx – half man, half lion – stands guard before Khafre’s pyramid and is said to be the protector of the people. It is said Khufu perfected the pyramid structure. The pyramid began as just one rectangular (mastaba) elevated structure. Then came one rectangle above the other (the step pyramid of Djoser), followed by a bent pyramid, which looked like a hexagon with a flat base. Then came the red pyramid, similar to Khufu’s – built by Khufu’s father in the ancient capital of Memphis. Djoser’s step pyramid is in Saqqara — a vast burial ground that served as a necropolis to an important capital, Memphis. Not to be missed is the ‘light and sound’ show in the evening, the pyramid’s history narrated in the baritone of Egyptian-born, Hollywood actor Omar Sharif. A visit to the Egyptian Museum – an impressive repository of pharaonic and Greco-Roman antiquities is a must. 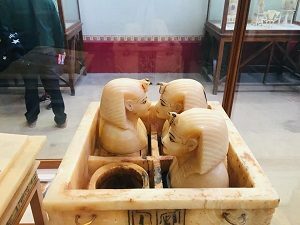 The crème de la crème of nearly one lakh artefacts on display are the mummies, among which is that of Egypt’s most famous Pharoah, Ramesses II of the 19th dynasty. Another huge draw is the section on the young prince Tutankhamun. 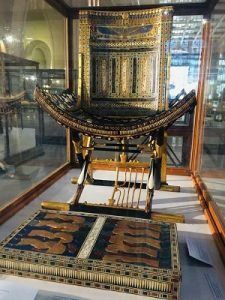 The reason why the least important pharaoh is literally the representation of Egypt’s 32 pharaonic dynasties is because his tomb had remained intact, never plundered. It gave us a comprehensive view of how early Egyptians perceived death and prepared for afterlife. On display are his funeral mask, his 110-kg gold sarcophagus and 1700 of the 5,400 artefacts found in Tutankhamun’s tomb! The rest have been transferred to a new museum that will open in 2020. We walked the corridors of this hallowed museum, on inlaid marble carpets, past imposing statues. We saw the contents of various tombs, a black granite sculpture of Queen Nefertiti, the Book of the Dead papyri, reliefs, busts and funeral art. 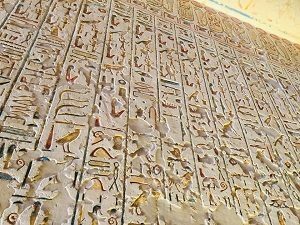 The only artefact missing was the Rosetta Stone – found in Rashid, Egypt and key to understanding ancient Egyptian literature. Due to the country’s colonial fate, the stone is now in the British Library. For a great view of Cairo, we went to the Citadel, fortified by the Ayyubid ruler Saladin to protect it from crusaders. The Citadel remained the heart of Egyptian government until the 19th century. The Fatimid Caliphs are buried five kilometres from the Citadel, surrounded by a vibrant 1000-year-old market, the Khan el-Khalili. 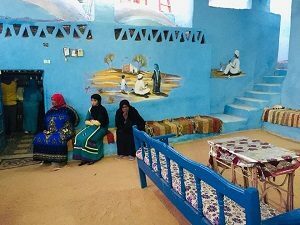 Walking its narrow-cobbled roads, drinking the tangy hibiscus juice, haggling with the local vendors and soaking in the sights and sounds of enduring Egyptian culture was a singular experience. 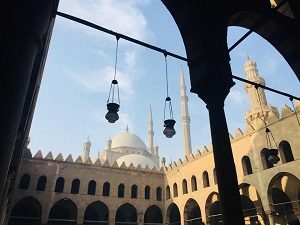 Egypt’s Christian past is preserved in Coptic Cairo – a serene nook in old Cairo that is believed to have been visited by the Holy Family. There are several churches, the most important of which is the Hanging Church, a synagogue, the Babylon fortress and the Coptic Museum. Some structures have stood ground since the 6th Century BCE. We visited the museum to look at the Gnostic Gospels, the 52 text which have myths attributed to Jesus’ sayings. Next, we flew to Aswan to check into the Nile cruise. After a quick visit to the Aswan High Dam, we took a boat to a Nubian village. The Nubians are 2,500 years old, a proud tribe that lived between southern Egypt and central Sudan. They have even ruled Egypt from 8th to 4th century BCE. They have their own language, are a tight-knit community and nobody can marry outside. Except for the fact that some have crocodiles for pets, they are very friendly! The next three days were visits to impressive temples on both sides of the Nile. Incidentally, Egyptians consider the east bank to be that of the living, and the west, that of the dead. The most imposing were the Abu Simbel temples. They are two massive rock temples built to Ramesses II and to his wife Nefertari in 13th century BCE. The temple facades have huge statues of the king and the queen, and the inside wall art is outstanding. Interestingly, the original site of the mountain-carved temples would have been submerged by Aswan dam’s reservoir Lake Nasser. In 1964, archaeologists cut the entire site into large blocks, transported it to the new site and reassembled them to look like the old! 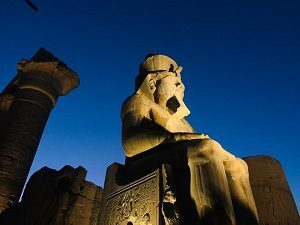 The same happened to the Philae Temple, dedicated to Goddess Isis, wife of Osiris (the ancient Egyptians believed them to be their Adam and Eve). Interesting were the crocodile mummies at the double temple of Kom Ombo, partly dedicated to Horus, and partly to the crocodile god Sobek. Our liner next stopped at Edfu for the Temple of Horus. Built in the Ptolemaic period (237-57 BCE), this is among the best-preserved shrines in Egypt. We sailed to Luxor to visit Egypt’s largest temple, the Karnak, which has a vast array of decayed temples, statues, pylons and other structures. Next was the Luxor temple, started by Amenhotep III, and then added by Tutankhamun and Ramesses II among others. At the rear is a granite structure dedicated to Alexander. On the west bank, is the Valley of Kings – a collection of secret underground tombs that could not be found by bounty hunters. It is a mausoleum of kings, like Tutankhamun — his mummy is in the tomb. One needs to watch out for the astounding wall art in the tombs. Ramesses II’s wife Nefartari lies in the Valley of Queens nearby. We stayed on another day in Luxor to see the Temple of Osiris, the God of the Underworld in nearby Abydous. Known as the gateway to heaven, pharaohs after mummification were brought here before they were entombed. The colours are the best preserved, the chisel detailing exquisite. 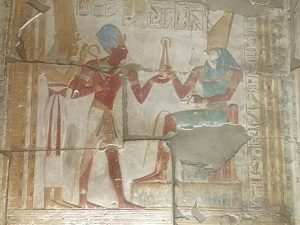 Our guide explained that early Egyptians made red with iron oxide, green with malachite, blue with lapis lazuli, white with limestone, yellow with ochre and black with coal. The medium used was egg white and glue of the acacia. 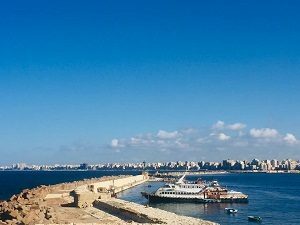 Alexandria overlooking the Mediterranean is spectacular. It looks nothing like the rest of Egypt. It was conceived as a capital by Alexander but built by Ptolemy I. The city and its ruins display Egyptian and Greco-Roman influences. Places we visited here included the Montazah Palace and its surrounding gardens and Pompey’s Pillar — a massive 30-metre column over the sparse ruins of the Temple of Serapeum. We walked on the beautiful sea promenade and visited the Alexandrian library. Standing tall in a bustling town square is the horse-backed statue of the Ottoman Albanian commander Muhammad Ali, the father of Egypt’s ruling dynasty. The most interesting site in the city is the catacomb, a part of the Middle Ages’ seven wonders. It is a pharaonic cemetery with Hellenistic and Roman influences. It had a shaft and three floors of tombs. The bodies were lowered through the shaft and pulled into the tombs. It was discovered by a donkey which fell through the shaft when out for an evening walk, circa 1900. High on our list of must visit places, Egypt did not disappoint us. It must feature prominently on all your bucket lists!